Offers personal loans for debt consolidation, major purchases and more. Apply now using our quick and easy online application or find a location near you. For over 100 years, we’ve been helping hard-working people tackle life’s challenges by providing the help you need when you need it. Our loan experts are from your community, understand your unique situation, and will treat you with honesty, dignity, and respect. We’ve extended over $120 billion in loans to over 10 million customers. Our customers use our loans for debt consolidation, household bills, home improvements, car purchases, and other major purchases. We do our best to help customers obtain the right loan for their unique situations. Debt consolidation loans: Debt consolidation consists of taking out one new loan to pay off multiple debts. In other words, you are replacing multiple loans with one loan. For example, if you have six different debts with an outstanding balance of $10,000, you could apply for one personal loan for that amount. If approved, you can pay off all six debts at once and only make one monthly personal loan payment going forward. Cash-Out Refinance Auto Loans: One of the advantages of a personal loan that is a cash-out refinance is that the cash-out portion may be used for purposes other than to pay off your existing auto loan. For example, if you’re approved for a $5,000 loan, you could pay off your existing auto loan with a $4,000 outstanding balance and use the remaining $1,000 to pay down other bills or make a major purchase. Personal Loans for Home Improvement: With a personal loan, you can make payments over time but still get the work done now. Our loans also feature fixed interest rates and fixed monthly payments that might make it easier for you to budget. Auto Repair Loans: Having the funds to get your car repaired when you need it can help keep your day-to-day routine running smoothly. Our personal loan specialists are committed to helping you find a personal loan for your needs and budget in a timely manner. Also available Boat Loans, Wedding Loans, Vacation Loans, Medical Loans, Car Purchase Loans, Auto Refinance Loans, Furniture Loans and more..
Read the OneMain Financial Personal Loans terms and conditions. Is OneMain Financial Available In Your State? OneMain Financial is available in the following states: Alabama, Arizona, California, Colorado, Delaware, Florida, Georgia, Hawaii, Idaho, Illinois, Indiana, Iowa, Kansas, Kentucky, Louisiana, Maine, Maryland, Michigan, Minnesota, Mississippi, Missouri, Montana, Nebraska, New Hampshire, New Jersey, New Mexico, New York, North Carolina, North Dakota, Ohio, Oklahoma, Oregon, Pennsylvania, South Carolina, South Dakota, Tennessee, Texas, Utah, Virginia, Washington, West Virginia, Wisconsin, Wyoming. OneMain Financial has received 3.77 out of 5 stars based on 31 Customer Reviews and a BBB Rating of A+. OneMain Financial, at its headquarters and all its company-owned locations throughout is a BBB Accredited Business. BBB has determined that OneMain Financial meets BBB accreditation standards, which include a commitment to make a good faith effort to resolve any consumer complaints. BBB Accredited Businesses pay a fee for accreditation review/monitoring and for support of BBB services to the public. Products & Services: This company offers financial services including personal loans and auto loans. 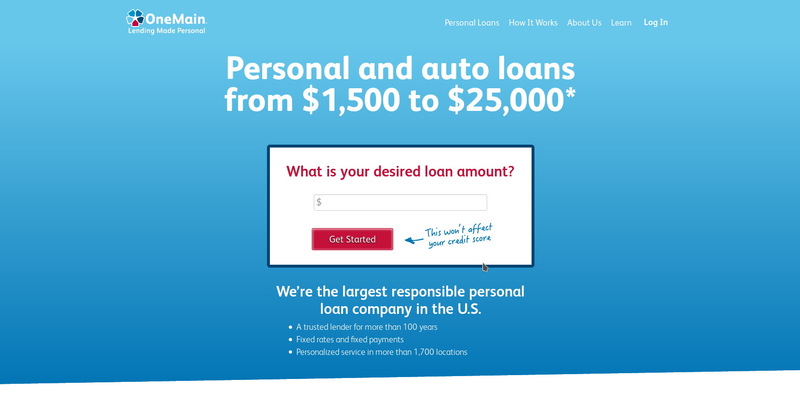 OneMain Financial is a large providers of personal installment loans in the United States with approximately 2.2 million customers and a nationwide branch network of more than 1,700 branches across 44 states. OneMain is headquartered in Evansville, Indiana, and has more than 10,000 employees. In March 2015, Springleaf Holdings, Inc. announced plans to acquire OneMain Financial from Citigroup for $4.25 billion. The acquisition was completed in November 2015 and the new company kept the name OneMain Financial. OneMain is currently traded on the NYSE under the ticker symbol “OMF” and is led by CEO Jay Levine.